By this direct and clear statment Animal Friends would like to announce The World Vegetarian Day (October 1, 2006) which is celebrated worldwide by the increasing number of vegetarians, vegans, and those who are not yet vegetarians or vegans, but aware of the importance of the vegetarian movement for the animals, people and environment. The vegetarian diet goes far back in human history, but in Europe the first man to speak about advantages of such a diet was the Greek philosopher Pythagora in the 6th Century B.C. by practicing and spreading a nonviolent way of life. The word vegetarianism derives from the Latin word vegetus, meaning healthy, fresh and full of life or Homo vegetus, meaning a physically and mentally healthy person. The basic meaning of the word implies to a balanced philosophical sense of life and not just diet which consists of vegetables and fruit. The first vegetarian society ("The Vegetarian Society") was founded in 1847. The word vegan has been formed out of the beginning and the end part of the word vegetarian and the origin of the word vegetarian symbolizes that veganism is in the roots of vegetarianism and that it is a logical conclusion to the vegetarian quest for good health without the suffering and death of animals. The first vegan society ("Vegan Society") was founded in 1944. Vegetarians don't eat animals, i.e. meat and fish, many of them not even eggs, and vegetarian vegans don't consume milk or diary products, and avoid all foods of animal origin. 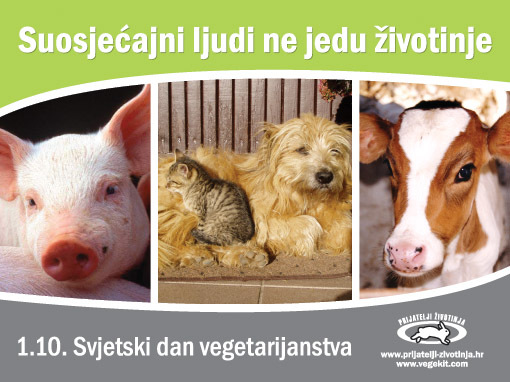 The World Vegetarian Day is celebrated on October 1 ever since 1977 with the goal to inspire people to think about ethical, ecological, health and humanitarian advantages of a vegetarian way of life. Today, where the number of animals being tortured and killed on farms for human consumption exceeds the number of 60 billion per year, it is necessary for all of us to think about the sufferings of the sensitive beings and take part in creating a world in which the rights of all animal species will be considered. The statement of the long-time ethical vegetarian Richard Gere speaks just of that: "As custodians of the planet it is our responsibility to deal with all species with kindness, love and compassion. That these animals suffer through human cruelty is beyond understanding. Please help to stop this madness."